If you want to play music, listen to the news or weather forecasts while boating you’ll need a pair of marine speakers. From cruising on the river, fishing on the lake or riding waves on the ocean, the best marine speakers can withstand harsh conditions and deliver high-quality sound. We’ve reviewed the top rated marine speakers and also compiled a guide to help you pick the right model for you. The Infinity Marine 652M is a weatherproof 2-way 6.5” marine speaker and our Editors Choice for the best marine speakers. They have enough power so you can blast music over engine noise, loud swells and cutting winds with great clarity. The Infinity’s are our editor’s pick because it delivers best-sounding audio at an amazing price. This recessed speaker is meant for a dash or cockpit installation. With a peak rating of 225W and up to 75W RMS, the power handling of this set of two speakers is great. The frequency response features a wide spectrum, and you can literally hear it. These speakers perform well in the low, medium and high range. Mids and treble are very balanced, accompanied by a powerful bass. The Infinity Marine 652M also has a high sensitivity rating of 92 dB, which makes it one of the most efficient marine speakers in that price range. It converts power to volume very well. The power handling is above average, which when paired with the high sensitivity, allows you to make a lot of noise on the water. For sufficient durability, these speakers come with a woofer cone made from polypropylene, a UV-resistant rubber surround, a cast polymer basket, sealed magnet and stainless steel mounting hardware. They’ll hold up against the sun, sea spray and scrubbing down the deck. Mounting hardware is included. These marine speakers deliver top sound and good value at a great price. 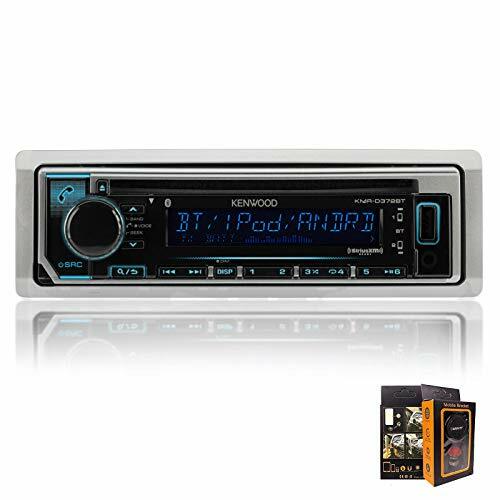 The Kenwood KFC-1653MR is a marine rated 2-way speaker set for your boat. This model is available in black or white and includes two pairs of 6.5” recessed speakers. They deliver good audio quality and accuracy with a good comparative loudness. With 150W peak rating and 50W RMS, the power handling of these speakers is less than out top model. Nonetheless they are able to perform well converting power into sounds while still sounding good. Same as our top model, these speakers feature cone woofers topped with a balanced dome tweeter. This give you good precision across low, medium and high range. With a rugged and durable construction, life on the water poses no problem for the Kenwood KFC-1653MR speakers. Water, salt and sun won’t affect the outstanding performance for a long time due to a white UV-resistant grill, composite speaker baskets and stainless steel hardware. 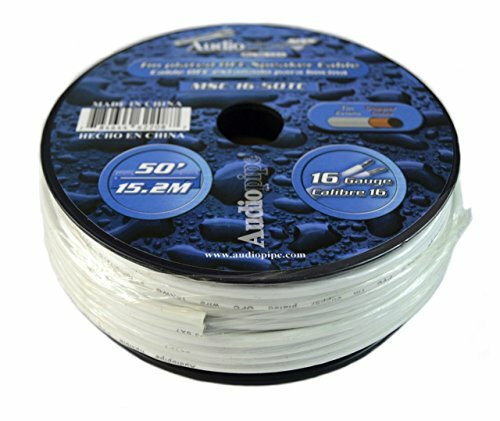 This pack even includes 50 feet of AWG 16 gauge speaker wire and are the best 6.5 marine speakers, especially considering you get 2 pairs of speakers in this kit! The Polk Audio DB651 is a recessed 2-way marine certified pair of speakers in 6.5”, but thanks to the supplied adapter rings, you can also fit them into 6.75” locations. They can play music at high volumes without strain and deliver smooth sound with great clarity. The DB651 from Polk Audio is essential for your boat party needs. These marine speakers are built for a long life at sea. Durable materials will withstand waves, rain, sun and wind. The resilient construction is matched with balanced and powerful audio. The individual speakers feature a driver and silk dome tweeter. The peak rating per speaker is 180W with a 60W RMS, so they sure are loud enough to be heard over engine noise and waves. The clarity is present over the entire spectrum thanks to a broad frequency range. The bass is present, but seems to be less powerful than on the previous two models. The audio is very balanced and warm with soft highs and mids and especially clear voice projection. A great feature of these marine speakers are the tweeters: you can pivot them to better aim volume at the target area, for example your position in the cockpit or a leisure area on your boat. The Polk Audio DB651 look stylish, deliver high fidelity sound and are some of the best boat speakers you can buy at any price! 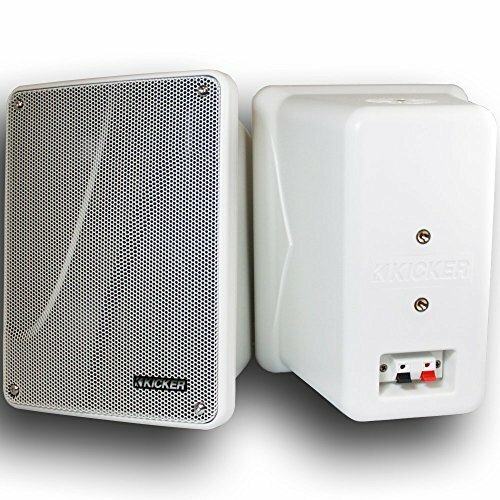 The Kicker 11 KB6000 is a pair of 6.5” tower marine speakers available in white or black. This is a marine quality full-range speaker with high efficiency for a very affordable price. For less than $100, you get a range of great features and powerful performance. This marine speaker pair mounts to your boat’s wake tower but can still be angled after installation, allowing for very flexible use. The audio on these speakers is crisp and bright, with a lower yet present bass. They sound natural with minimal distortion or noise. With 150W peak and 75W RMS power, volume is not your concern. Thanks to a full range spectrum, these marine speakers are suitable for every musical genre. Polypropylene cones and rugged Santoprene surrounds make these speakers fit for outdoor marine use. The built is sturdy and will withstand adverse weather conditions from heat to water. Rough transport and vibrations will still have these going for a long time. The inner circuits can withstand bumpy waves and shaky rides. The Kicker 11 KB6000W speakers feature an amazing price and are the best entry-level tower speakers you can get for a great value and good audio. The sound you get will surprise you in quality and power. These are the best marine tower speakers in its price range and will definitely get your boat party started! The Sony XSMP1611 is a marine speaker with above average audio qualities. This speaker pair comes in white, but you can remove and repaint the grilles if necessary. This model is meant for a 6.5” recessed installation. The Sony XSMP1611 is well-suited for use on the water: with IPX5 certification, it will withstand sprays of water and heavy weather. The speaker is also ASTM certified for resistance to UV rays and salt water. You can expect a long service life from these speakers. The power rating has a 160W peak value and 70W RMS. Audio performance is beyond expectation for speakers in this price range. Clarity, presence, full tonal range and definition are all there. The bass comes in with a punch, but is not overpowering. This might be a minor drawback if you prefer a stomach-kicking bass. The audio on these speakers is very refined with no distortion even at high volumes. If you’re looking for very affordable, reliable and rugged marine speakers with excellent audio, Sony has you covered with the XSMP1611. The Kicker KM654LCW is a 2-way marine speaker with something special. This pair of speakers is equipped with removable multi-color LED accent lighting. With the optional remote (not included), you can change the lighting to fit the mood or music. Choose among 20 different colors and 19 dynamic modes, including brightness, fade, and strobe. These marine speakers come with black and white grilles, so you can select which suits your surroundings best. Thanks to the integrated moisture-draining system, you never need to worry about water sprays. With weather-proof materials and high-quality components, the speakers excel at marine use and exceed industry standards. The audio performance of the KM654LCW is also quite satisfactory. With a high 90 dB sensitivity and power of 195W peak and 65W RMS, these speakers bring volume that doesn’t struggle against engine noise and loud waves. The 2-way speakers feature Titanium tweeters for spectacular highs and clear midrange sounds. The woofers complete the lower end of the spectrum for full-range audio. The Kicker KM654LCW marine speakers allow you to have a blast on the water with your music, and the LED lighting is a nice extra touch to further enhance the mood on deck. The Boss Audio MRWT40 is a pair of 4” 2-way marine speakers with powerful audio for mounting on your wake tower, UTV or ATV roll bar. These marine speakers are fully marinized, meaning they are coated and sealed to protect them in the humid and salty marine environment. The are not entirely waterproof, but feature UV-protection. They are constructed from resilient and durable polymers with excellent sound qualities and long lifespan. These speakers come with 200W peak and 100W RMS power per speaker, allowing you to blast music and beats to be heard by any wakeboard or water ski rider behind your vehicle. They convert energy into sound very efficiently thanks to a high sensitivity of 94 dB. The 4” speakers feature a polypropylene cone and 1” Mylar tweeter, giving you a wide variance of sound modifications and channel handlings with extra durability. The Boss Audio MRWT40 marine speakers cover the low, mid and high spectrum quite well with enough punch and sufficient clarity. Distortion is no issue, even at high volume levels. These tower marine speakers feature good audio at an entry-level price. Marine speakers need protection from the elements to be durable, and depending on the intended use, they also need sufficient power to carry audio over the noise of wind, water and boat engine. You’ll also need to consider where on your boat you’ll mount the speakers, how many you need, and if they’re compatible with existing audio hardware. If you know what you want and need, choosing the best marine speakers is quite simple. To determine which model suits you best, pay attention to the following factors and features. We’ve reviewed two different types of marine speakers which lend themselves to different installations. Recessed speakers are meant to be installed on your dashboard or in a panel, wall or ceiling on your boat. They require a cut-out that fits the size of the speaker. Tower speakers are usually a little more powerful and are attached to your boat’s wake tower. Conical speakers usually face aft so you can blast music in the direction of someone skiing or boarding behind the boat. There are also box-shaped tower speakers which can be angled in different directions, depending on where you want to listen to music. For recessed marine speakers, there is no standard size, yet 6.5” is a very common diameter. If you’re upgrading your audio system or intend to make use of existing cut-outs, pay close attention to the dimensions so you can use the same mounting locations without alterations. Yet keep in mind that on any speaker set of the same diameter, the grille or height of the speaker can be constructed differently. If the installation recess is very shallow, you’ll need a low speaker height. Think about where you’ll run the wires if your boat doesn’t yet have speaker wiring. Especially for tower speakers, it’s best to thread them inside and not leave them exposed to the elements. Check where there are grounding plates on your boat so you can properly ground electrical equipment. Each audio installation on a boat will pose a unique set of challenges. This pertains to how much power your marine speakers can handle. Too much and you’ll blow out your speakers. The Wattage that most manufacturers specify commonly means peak (maximum) wattage. The root mean square (RMS) value show how much continuous power the speaker can handle, usually per channel. This is the more important value in practical terms. Should you receiver put out 100W RMS per channel, you can connect easily speakers with a 100W RMS value each. However, if the peak wattage is 75W for your speakers, you would put them at risk by connecting them. Find the output values for your receiver or amplifier and choose the power rating of your marine speakers accordingly. Speaker sensitivity – is the ability of marine speakers to effectively convert power into sound, creating audible waves from the energy delivered by receiver or amplifier. Sensitivity is specified in decibels (dB). A common home theater system speaker has a rating of 80-84dB, while higher quality models average around 87 dB. A lower rating means you have to pump more power into the speaker in order to increase the volume. A value in the mid-80s is common, anything above 90 dB is excellent. Frequency response – is the range of audible frequencies a speaker can reproduce in the spectrum of human hearing between a deep bass of 20 Hz and the high frequency of 20 kHz. Especially older people won’t hear up to 20 kHz, and you’ll feel bass frequencies below 30 Hz more than you can hear them. Still, a good speaker has a broad frequency response spectrum. In terms of audio, the best marine speaker set depends on what you’ll be playing over them as different models lend themselves better to different genres of music. For versatility, most marine speaker models are 2-way systems. This means they have separate frequency bands and use a so-called woofer for the lower end of the spectrum and a tweeter for the high frequencies. A 3-way speaker employs a woofer, a mid-range, and a tweeter. A 2-way solution is sufficient for pop music, talk radio, news and spoken word and most applications. For music with more high end frequencies, you’ll need to adapt your speakers. For a party boat, consider installing a separate subwoofer to get the bass thumping. Audio speakers contain strong magnets. 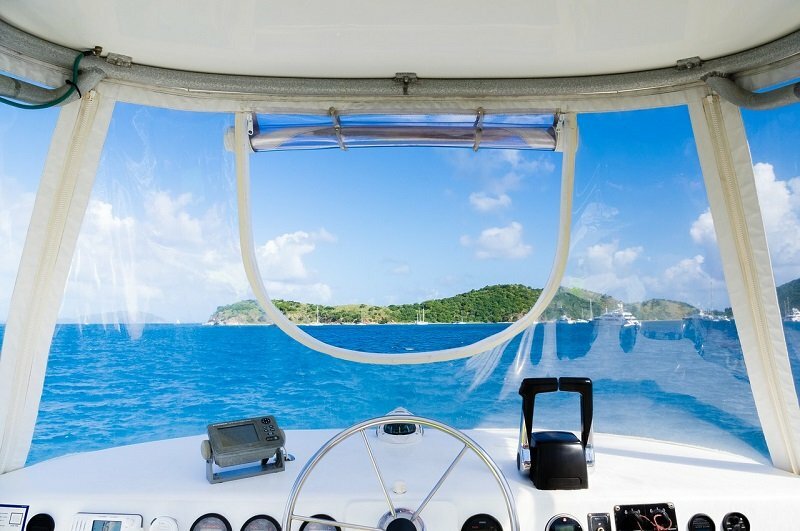 In marine application, a speaker can distort or even damage sensitive equipment such as the boat’s compass or other devices depending on magnetism. This is a concern if you’re installing speakers close to these devices, for example within 1” or 1.5” range. 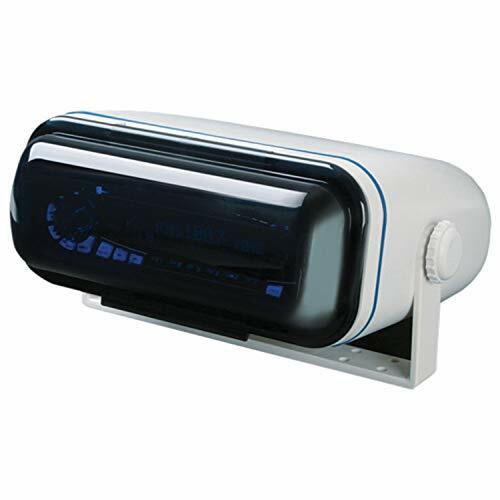 In that case, you’ll need marine speaker with magnetic shielding. These will have a metal lining or a second magnet to cancel out or block the speaker’s magnetic energy. Q: How many marine speakers do I need? A: At the very least, you’ll need a pair of two speakers. The most common installation calls for two dash-mounted speakers, typically near the receiver, tuner or audio hardware on your boat’s dashboard. If you have a larger vehicle, you’ll want to consider installing more than just one pair of speakers. Q: What are the different types of marine speakers? A: Recessed speakers are cone-shaped and can be fitted into your boat’s dash, panels or walls. Tower marine speakers can be mounted to the bars of your boat tower. These tend to be more powerful and can be used to blast music from the boat, for example to a rider being towed behind. Depending on the individual model, some speakers require an amplifier for extra power. Q: What is special about marine speakers? A: Marine speakers feature corrosion-resistant hardware and casings made from polypropylene and rubber to withstand salt water and the elements. They are powerful enough to be heard over noise from the water or the engine. Some models are also magnetically shielded in order not to interfere with onboard hardware such as a compass. Q: What audio cable should I use for marine speakers? A: The American Boat and Yacht Council (ABYC) recommends stranded copper wire for marine wiring. Other metals corrode to quickly and are not fit to withstand the vibrations on a boat. A tin or solder coating on so-called tinned wire further protects the copper wire from corrosion. Also make sure the gauge of the wire is sufficient and that there are enough strands. Marine cables sized by the American Wire Gauge (AWG) will have a “boat cable” label on the insulation. Type 2 cables have enough strands for speakers and general wiring, whereas type 3 cables are called for installations with a lot of cable bending, flexing or jostling. Q: Do I need a receiver? A: The receiver sends the audio signal from the source (radio, CD, smartphone etc.) to your speakers. Depending on your receiver and speakers, you can send the signal directly to the speakers, or need to pass it through an amplifier first. You can power most marine speakers directly from a receiver, but more powerful models such as tower speakers can require amplification. Q: Why can’t I just use some car speakers? 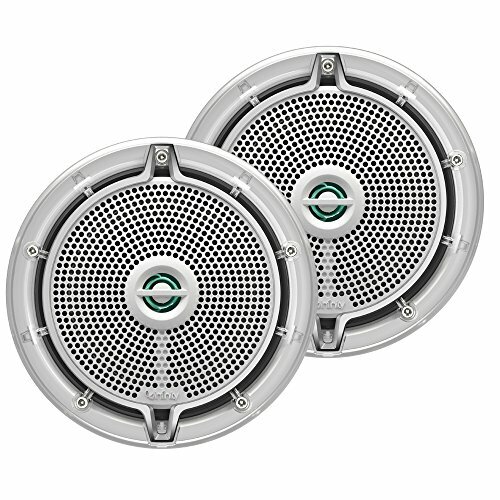 A: Boat speakers are specifically built for the marine environment. Imagine a set of car speakers exposed to sun, salt, wind and spray of water – they simply wouldn’t last very long. Marine speakers are designed for performance on the water: they are sealed and feature rubber surroundings as well as UV-resistant plastic casings and corrosion-resistant parts. No matter what kind of water craft you own, quality boat acoustics with good marine speakers allow you to enjoy music and audio entertainment during your time on the water. We hope you’ll find our guide informative and helpful so you can select the best marine speakers for your boat or watercraft. Enjoy your rides, cruises and trips with your favorite music and entertainment!